How does he move large stones with out fancy machinery? 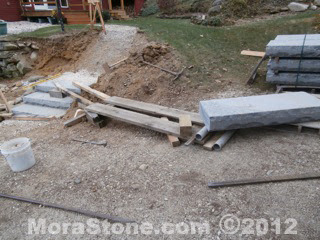 TJ Mora from Vermont www.morastone.com moves all his large stones the old fashion way. His tools are his grandfathers 8 foot pinch bar, some wood - then some more wood, 4 inch PVC pipes and 5 gallon bucket filled with stone. The picture above has his extra helping hand called the 5 gallon bucket filled with stone. With the bucket hanging at the end of the bar this lets him step away and place each PVC pipe under as needed. 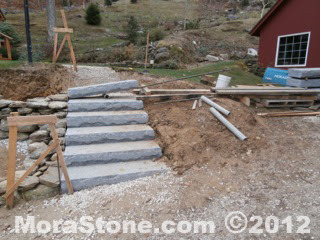 Each one of these fabricated step stones weigh in at around 1000 pounds. Showen in the photo TJ is building up his cribbing up under the planks as he moves the step stones up hill. "Slow and easy"... he tells me. TJ finds the larger 4" PVC pipe makes it easier for him to roll the stone opposed to smaller size PVC pipes. So far he has a 0% failure rate of collapsed pipes. One other benefit he finds the large pipes rolls over uneven surfaces much better then some of the smaller pipes. 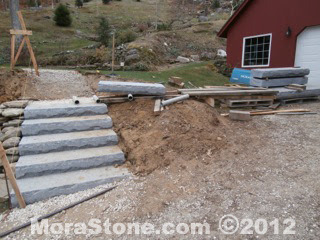 TJ had these steps delivered to his job site and placed in a spot which helps him be smarter with his build. 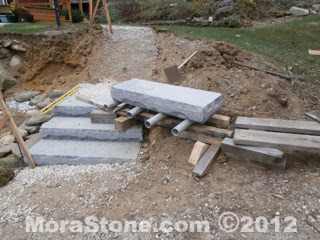 Job-site to job-site may vary forcing other choices to be made to move stone of this size. In the picture above you can see pallets used as a platform to help moves each stone from its home across the cribbed planks (skid) to were it will rest. He finishes off with each stone the same way he started. 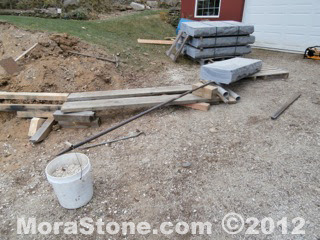 One 6x6 with his pinch bar under the stone and the 5 gallon bucket to now remove his PVC pipes. Look no hands!! TJ has made this building practice common to him. He has mastered this method which in turn helps him move stone just as fast as a team of men with less hassle and more $$$ in his pocket. No smoke breaks, late to work, call in sick or mechanical failures. We can all learn a trick or two from one another. MY favorite was the 5 gallon bucket trick and the stick under the PVC pipe. I was wondering how he did it. So I asked. For some reason TJ seems to take on jobs others consider to be a logistical nightmare. To him its just another day at the office under the Vermont sky. 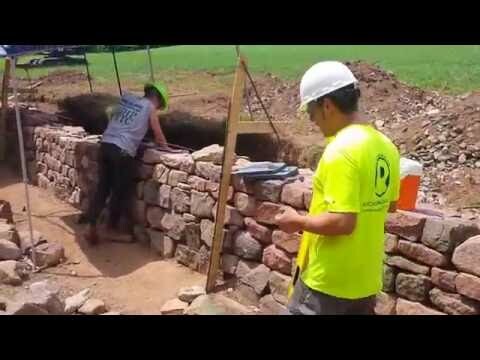 We can all learn a lesson or two from this smart stone mason. Like my wife says work smarter not harder. She keeps telling me this because she says she's lazy! YA RIGHT! I'm not stupid, I just don't lesson as well as I should. Or maybe I'd be wealthy by now. Special thanks again to TJ Mora for all his photos and time sharing this with me to share with you. Side notes: No Ibuprofen was taken to write this blog. Mark, thanks for the great post! I just added a link to your blog on TJ's site, along with a specific link to this post. GG and TJ thats great! How cool is that. Well as you know TJ does a great job, He said your the one who helps with the web. I was sure to ask for bigger images next time. But these do a great job telling the story. Nice to see he takes the time to do this. So many do not. It might be one more step. But a step not worth missing. No Steps (puns) intended. Its great when we all can work together. The world is a big place but not when we all work as a team. Keep on pushin that good man of yours. Great post! I have been under-utilizing that stack of employees that lives in my tool shed. Excellent post Mark! I use the same techniques. 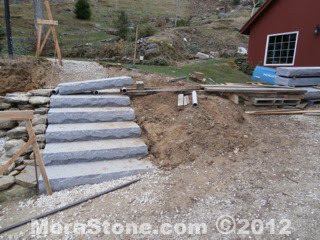 Just finished up a large staircase with similar sized stones. Some of my contemporaries here questioned my sanity because there was an excavator sitting there available on the job site. Customers seem to delight in the old world methods that marginalize the noisy, exhaust-belching machines. Adds an element of mystery since physically- I am a but a twig. Customers scratch there heads wondering how the big stones are moved about and set while they are away. (Granted, I could make more $ getting the stones set quicker with the machine but it would violate the integrity of the peaceful scene and undermine the whole reason why I do this for a living). I know your not paying $4. a gallon to make it happen. But I hate to see your lunch bill. There is something extremely rewarding knowing you did it all without help in a traditional day. I often wonder how the old timers did it back in the days. I'll drive by a historic site and wonder. Wishing the stone would tell me there secrets. I'm all about the simple oldschool techniques. Here's a great video for those that haven't seen it.